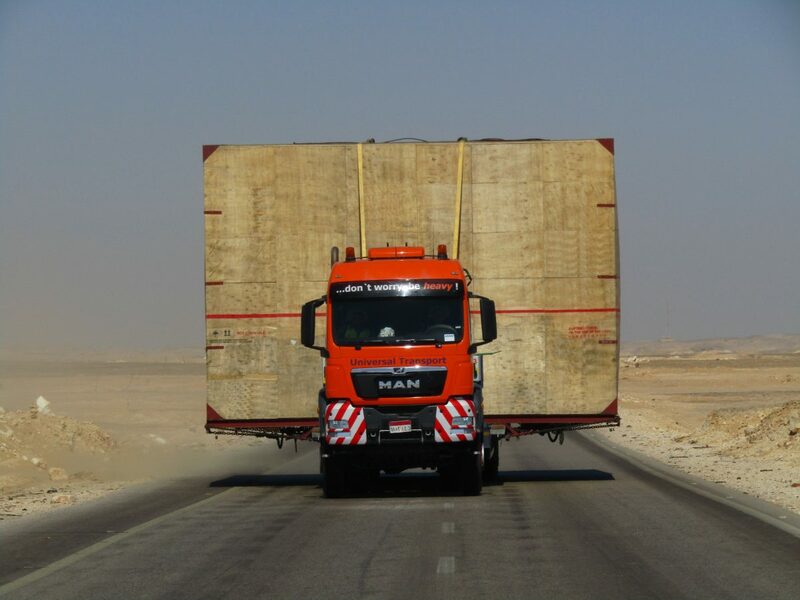 Not only in the ancient Egypt heavy loads had to be transported over long distances and rough terrain. Even today, transports in the land of the pharaohs are a challenge: The heavy transport specialist Universal Transport had the task of bringing an extraordinary cargo from the Egyptian port city of Alexandria to the west bank of the Nile, 700 kilometers away. The transported good was a steel construction of a cement machine intended for a construction site in Sohag. Safely packed in a wooden box, the construction had dimensions of 7.10 meters length and width, 5 meters in height and weighs a total of 30 tons. The overall dimensions of the transport were significantly higher at 62.5 tones, just short off 20 meters in length, 7.10 meters width and 6.05 meters height. The route to its destination came with some hurdles, but the Universal Transport office in Egypt mastered them perfectly. For the road transport, a telescopic, 5-axle semitrailer was used. Since all load securing lashing points were located on the bottom of the transport box, Universal Transport decided to mount additional lashing points on the top to ensure maximum safety. First, however, the oversized heavy cargo had to leave the port area in Alexandria. The problem: The port exit was clearly too narrow at 5.80 meters – and a temporary dismantling of the gate was not approved by the port authority. Universal Transport decided to use a reach stacker with a lifting capacity of 70 tons, with this the transport box was simply lifted above the gate and the first hurdle was overcome. The next obstacle was the toll station in Alexandria. On behalf of Universal Transport, their employees removed the roadway barriers in front of the toll gates so that the low loader could pass the narrow passage. And finally, two bridges, which were actually too low for the transport with 5.93 and 5.95 meters had to be mastered. With the help of the special semitrailer, the ground clearance could be reduced from 105 to 90 millimeters and the bridges could be passed safely. The approximately 700-kilometer drive from Alexandria to Sohag took a total of three days. Planning and coordination had taken about three weeks to complete. But the good preparation was worthwhile; the heavy load transport arrived on time despite the above described hurdles. “With this transport, we were able to show that our experienced and well-coordinated team always has the right solution for all kinds of challenges once again,” says Ahmed El Dahshan, Branch Manager Universal Transport Egypt.